Hi Dan, the amount of mirroring in your journey and mine is uncanny, same age/pre op psa at diagnosis, same scores, same post op pathology. 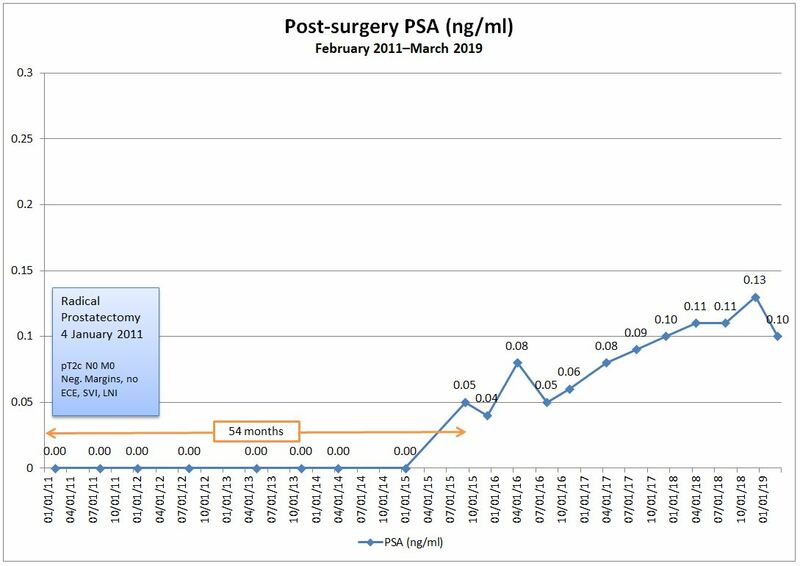 The only major difference being that my psa made an unwelcome reappearance at 30 months post op. I’m currently at 0.06 having been up to 0.08 and down to 0.05. I completely get the rollercoaster of psa tests, anxiety, disconnect you have been on, I’m going through exactly the same! Also, my next onco appointment is on April 18th. I do wish you the very best and thank you for this wonderful blog. We’re both going to face some huge decisions soon, but let’s hope not too soon. I’m on an up ATM, and have actually never felt better, but the psa monster still comes calling at 3am quite regularly. Sorry to hear that we’re seated side-by-side on that roller coaster, but it’s always good to have someone to compare notes with along the way. I’d be really interested in hearing what your team says after your appointment on the 18th. There are so many different approaches to this that it’s maddening. I definitely don’t want to rush this decision, so I’m in no hurry to make it, but I also recognize that there’s a narrow window for any “curative” treatment option as well. Yup go live life, the test will arrive before you know it. Thanks, Andrew. I just took a little Sunday drive up the coast—Laguna Beach, Newport Beach, Hutington Beach. It had been forever since I had made that trip and was good to get reacquainted with the area again. Glad to hear that disconnecting worked for you. It is a great achievement. Wishing you more peaceful times ahead. Thanks, Phil. It was a bit easier than I expected it to be. All the best to you, too! I think at some point we just want to be done with it. That’s the way I was with my last PSA. I thought for sure the Xtandi would have failed and my PSA would be up. I was ready for a bad result. What I got was inconclusive. The oncologist decided to call it good and I’m still on the Xtandi. I guess that’s good. I hope you get a conclusively low result. Disconnection is such a wonderful option to have available when you need it. For me it helps me stay focused in the present, which is usually ok to good. I suspect your photo excursions also provide wonderful escapes from all this cancer crap. You can focus on the beauty in what’s around us. I’m looking forward to your next set of images.